How to go to Mediterranean? What to eat in Mediterranean? Where to go in Mediterranean? What to do in Mediterranean? What to buy in Mediterranean? sunshine 300 days ayear, and is a paradise for swimming, sunbathing and watersports. You can also explore important historical sites dating back thousands of years, set in a landscape of pine forests and citrus groves and learn about the mythology that is intertwinedwith the area.The Mediterranean coast is as full of antique artefacts as the Aegean. 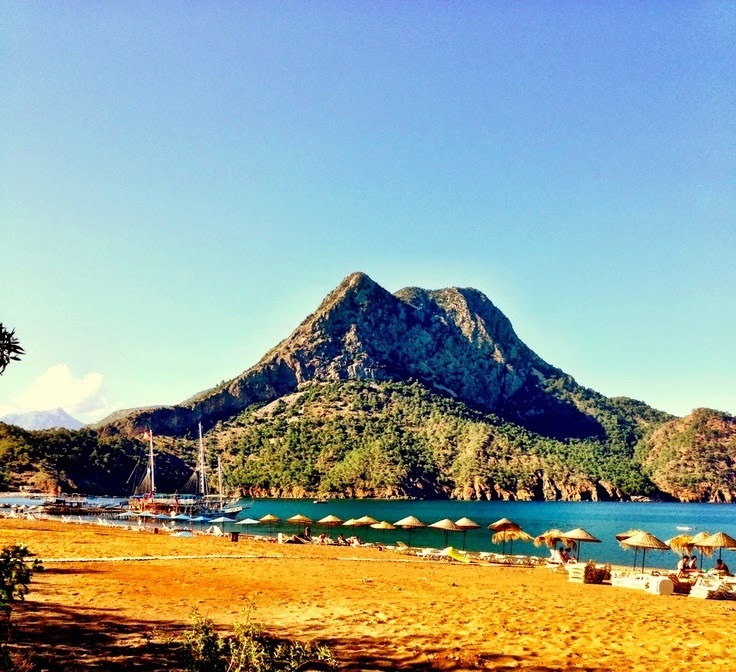 In the ancient Lycian region, west of Antalya, you can experience the beauty of the mountain cities of Termessos and Arikand, as well as the coastal towns such as Olimpos, Kale,Kekova and Kas. The ancient cities of Perge, Aspendos and Side are located on the coastal plane east of Antalya, originally called Pamphylia. Antalya is one of the Mediterranean's most important cities and is Turkey's hottest vacation spot, with the beaches of Konyaalti to the west and Lara to the east, lying at the foot of Antalya's massive mountain range. It is an attractive holidaygetaway with palm-lined streets, beautiful parks, an abundance of accommodation, restaurants, bars and nightclubs, and a picturesque marina. The symbol of this city, founded in the 2nd century BC, is the Yivli Minaret, which dates back to the Seljukera. The Asagi Duden Waterfall to the east flows over huge boulders into the sea. West of Antalya is the attractive little holiday town of Kemer, famous for its sandy beaches surrounded by pine forests and mountains.The next big town east of Antalya is Alanya, a panoramic port city on the southern slopes of the majestic Taurus Mountains surrounded by orange, lemon and banana groves. Used by the Seljuk Sultan Alaaddin Keykubat as a winter residence, Alanya’sshipyard dates back to the same era and was one of the most advanced in the world at that time. It is also famous for its 9th century castle and its popular beaches.Near Anamur is a castle from the Middle Ages, situated between two beaches and one of the most spectacular castles along the coast. The road from Anamur to Silifke, with its endless curves and bends, follows a route studded with breathtaking coastalvistas.The dilapidated caves near Narlikuyu are called Heaven, which has a small church inside, heaven and Hell (Cennet ve Cehennem). The castle of Kizkalesi, which is situated in the water across from the medieval castle of Korykos, seems to rise out of the seaitself. Two surprises on the road to Mersin, are the ancient Roman cities of Kanlidivane and Viransehir. With its charming parks, beach promenades, commercial port and free trade zone, Mersin is one of the most modern cities on the Mediterranean.East of Tosos, the Cukurova plane is a fertile agricultural region known especially for its cotton fields. In the middle is the city of Adana with its rich textile industry, and to the east is the Dortyol (Issos) Plane, where Alexander the Greatdefeated the Persian king Darius. As a result of his victory, a port city bearing his name was established which is now the modern day Iskenderun.The road leaves Iskenderun on the southeast and goes through the Belen Pass to Antakya (Antioch). This first Christian community founded by Saint Peter has given Antakya a special religious significance, and the first sermons were preached in nearbycave. It is considered a place of pilgrimage, and the city also boasts a mosaic exhibition of rare beauty in its museum.Kahramanmaras is a relatively undiscovered province of the Mediterranean. One of its best-loved features is the cuisine, which has its own specialities like its special orchid drink (salep) and its world famous ice-cream made from goat and cows’ milk.The historical legacy of Kahramanmaras in the Ottoman Empire is still relevant today with its gilded silver, leather and copper works.